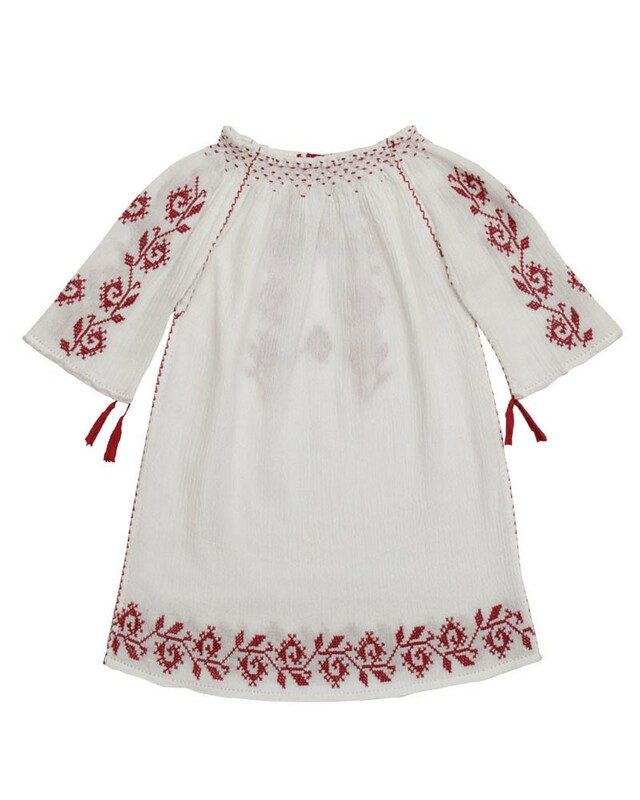 Delicate embroidery, hand-sewn by authentic folk artists and refined Rosebud adornments decorate this traditional handmade christening outfit for girls. 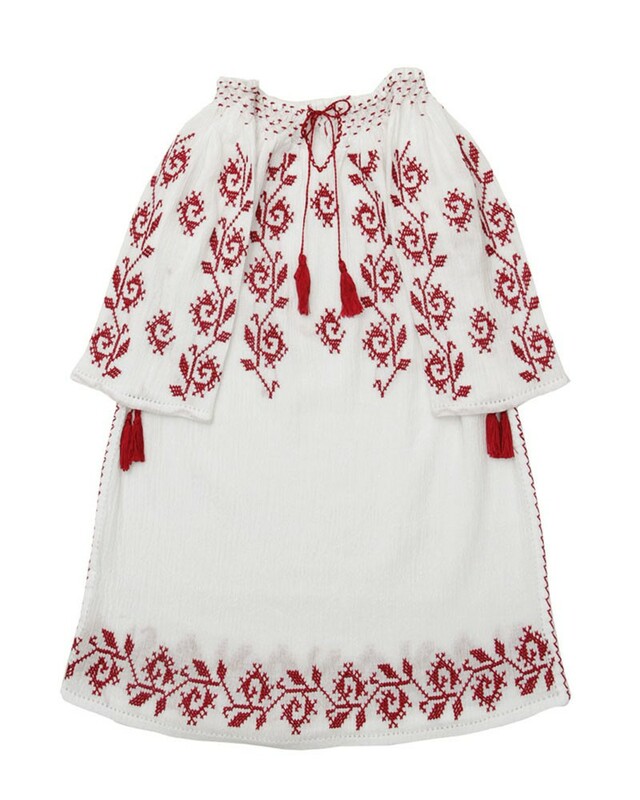 Made only from the finest fabrics and embroidered with ruby red cotton thread, the baptism gown consists of a diaphanous long-sleeved white dress and a matching scarf decorated with lace and handmade ornaments. Your little girl will feel like a princess wearing this traditional dress with matching scarf, made only of 100% cotton fabric and painstakingly embroidered by hand. Sheer and casual, the dress is ideal not only for baptism, but also in the hot summer days. Made entirely of cotton fabrics, the gown is not only comfortable, but also a stylish outfit for your baby. 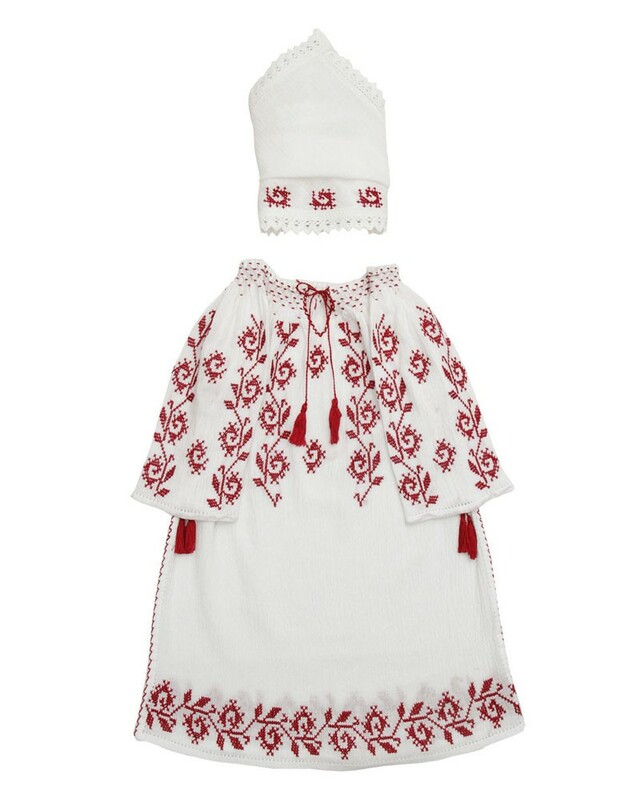 The traditional christening outfit for girls is 100% authentic and handmade by folk artists. This exquisite gown is adorned with delicate hand crafted rosebud decorations and embroidered with cotton ruby red thread on the finest cotton fabric. Embellished by its refined embroidery, the baptism hand stitched gown consists of a dress with long sleeves and a scarf decorated with lace. Hand wash in warm water with mild suds and use moderately warm iron. Do not bleach or tumble dry. To protect the embroidery, you are advised not to use the iron directly on the dress. 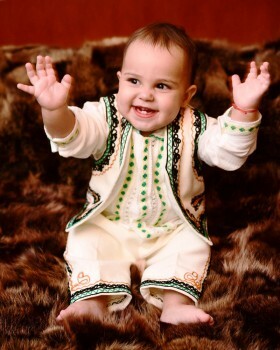 Ethnic and delicate embroidery, hand-sewn by authentic folk artists and refined Rosebud adornments decorate this traditional handmade christening outfit. The exquisite decorations unfold as rich embroidery adorning the chest, sleeves and bottom of the baptism gown in complex geometric shapes, painstakingly stitched. 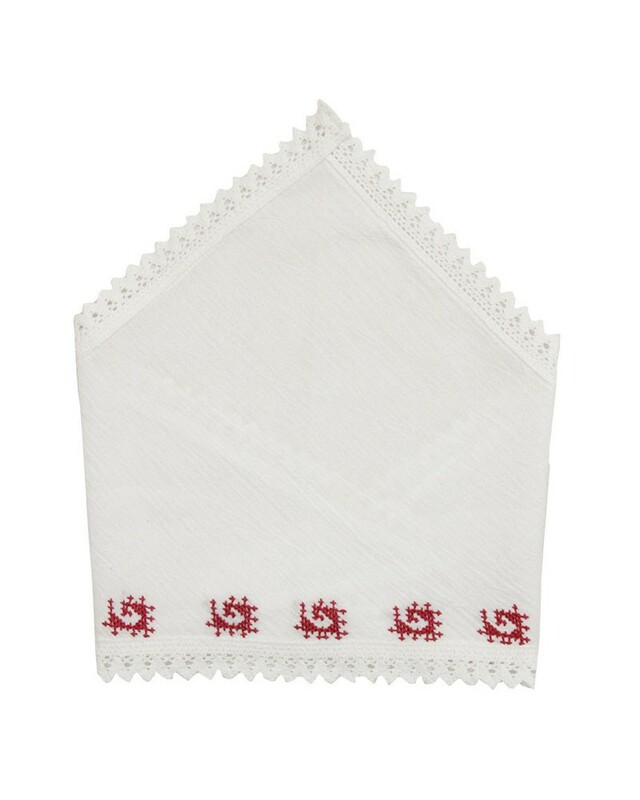 The same signs are found on the scarf, also hand-stitched with decorative lace sewn on the edges for added sophistication. This dress can be made to order in other colors of embroidery. 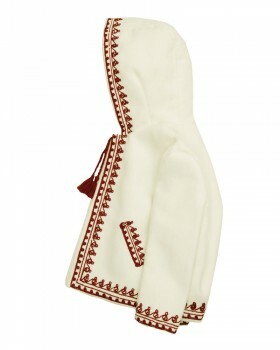 You can match this baptism handmade gown with other traditional baby clothes, such as the handmade embroidred coat. Anilu store brings you the finest authentic Romanian traditional blouses, 100% handmade and embroidered on natural sheer fabric. More than a simple piece of clothing, the authentic Anilu blouse means style, originality and refinement.